The 1993-built asphalt/bitumen tanker MV Infinity I started taking on water and continuously listing to the starboard side on June 8 due to a crack in the ship’s hull. Crewed by fourteen Indian seafarers, including the Master, the tanker’s list was increasing despite the crew’s de-watering efforts. At the time, the 83-meter long tanker was underway some 20 nautical miles off the coast of Goa, India. Loaded with some 1,750 tonnes of asphalt, the ship was transiting from Kandla port in Gujarat and proceeding to Karwar, Karnataka when it developed the crack in heavy seas. Indian naval personnel assisted the vessel with additional pumps, and MV Infinity I was anchored off the coast of Goa during the night. 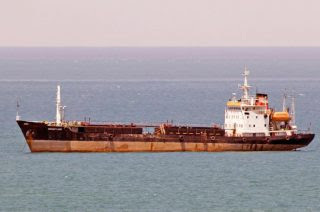 While it was still listing, the 1,920 dwt ship continued its journey to Karwar harbour in the early morning hours on June 9 at a speed of 4-5 knots, as it was able to contain the flooding. The tanker, being escorted by Indian naval ship INS Trikand and two coast guard vessels Amal and Shoor, is expected to reach Karwar Port in the late evening hours.